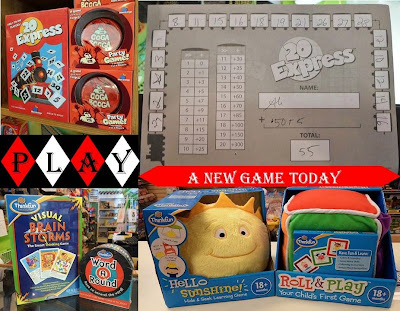 If you've read this blog or been in the shop, you are probably aware by now that these two game companies, Blue Orange and ThinkFun, are two of our most beloved game companies. Both are great at conceiving games that are both challenging and fun, and they make games for all ages. Up first is Ooga Booga. As you can surmise, this game is quite silly! Done in the same round card format as their bestselling Spot It! games, the purpose of this game is to work on memorization. It's also pretty giggle-inducing. Each card has a picture on it with a nonsensical word on top. Place the first card down, repeat the word (for example, Moki), and then add '-ha' to the end. Moki-ha. Then place the next card over it so that it covers that first word. Let's say the second word is Ooga. You have to remember what the previous word is, then add the new word, and add -ha at the end. So this would now be Moki-Ooga-ha. You keep going around the group adding words until someone makes a mistake and then start over again. There are also action cards such as pounding your fist, so if you were to add that card onto our example, you would say Moki-Ooga, then pound your first, then say -ha. Written out, it doesn't sound nearly as much fun as it is when played. This game is recommended for 7+, for 3-6 players, though we did play using only 2 people and it seemed to work just fine. 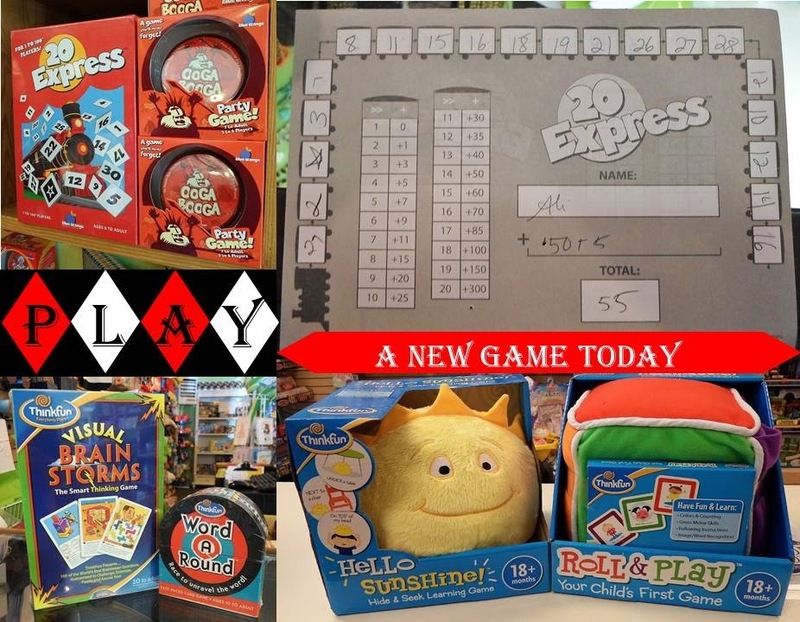 For the more mathematically-inclined, we have the brand new 20 Express game. All of us here have been having a blast testing our statistics skills and trying our luck at building the longest sequences of numbers ever! Well, that's an overstatement, but we've had some pretty tense games here already. This game is simple: Each player gets a card with 20 empty train cars on it. You have a bag of tiles with numbers on them. Pull out one tile, and whatever that number is, you have to place in one of the 'trains' on your paper. The goal is to have the longest sequence of numbers (ex. 1, 2, 4, 6, 7, 7, 8). As you can see from the example, you can skip numbers, but they must go from the smallest number to largest. If you must (and realistically, probably will) start a new 'train', you can. Check out the photo of the score card up top to get a better idea. Whoever has the longest trains will win the game, and while it does sound like chance plays a big part in this, a lot does depend upon devising a strategy based upon what numbers are left in the bag and what the odds are that you'll get a particular number. This game can also conveniently be played by 1 to 100 people, so whether alone or with a convention, you can all play! For all of you ThinkFun enthusiasts, we have two new games, WordARound and Visual Brain Storms, to challenge you. WordARound is a card game with round cards that have a word wrapped around the edge of the card. There is no indication as to where the word begins and ends, so the goal is to be the first to figure out what the word is. Visual Brain Storms is a set of cards with different mind game challenges to solve. They have them sectioned by difficulty level, and they do get tricky! And for the younger ThinkFun fans (that's right you 18 month-olds), we have Hello Sunshine and Roll & Play. Hello Sunshine teaches your children about different, common prepositions, such as 'in', 'on top', etc. Roll & Play is all about identification and performing actions. You roll the giant colorful cube, have the child identify the color, and then they take a card of the same color and are prompted to 'sing a song', 'find something blue', etc. Both of these games a perfect for teaching your child various skills and encouraging them to complete tasks. So come on in and check these new games out. We even have demos of Ooga Booga and 20 Express on hand, so if you want to try before you buy, you can!